Eliopsomo is based on a traditional Cypriot Olive Bread. I have made a few changes to the original recipe which is included in my Cookbook “Mint, Cinnamon & Blossom Water, Flavours of Cyprus, Kopiaste” as well as in Volume 2 of my e-book. 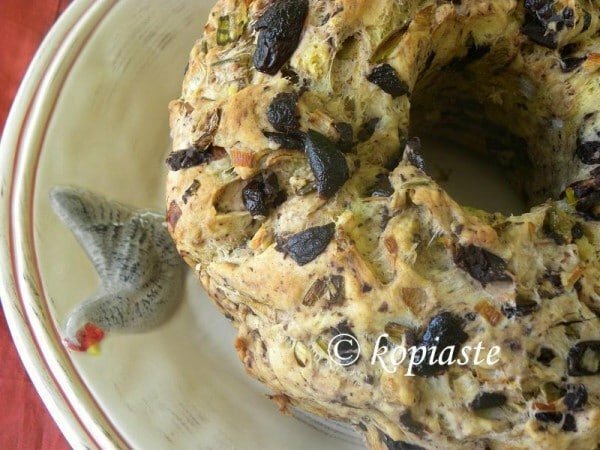 I know that I said that I will be on hiatus for a short while and I will still continue for a short while but whenever I can, I want to post a few recipes which are suitable for Easter Lent. I first made an Elioti (see recipe here), in which I added feta and rosemary and liked the combination of these two ingredients that I included them in the bread as well. If you want to make the recipe “nistisimi” Lenten, just omit the feta. With the same dough and filling you can also make some olive turnovers. In a bowl dissolve the yeast with water, add sugar and 3 tbsps flour and mix. Cover with cling film and set aside to rise. Attach the dough hook to your mixer and put the remaining flour in the mixer bowl, with salt and olive oil. Mix to absorb olive oil and add tangerine juice until the dough forms a ball around the hook and does not stick on your hands. Add water if necessary. Cover with a napkin and place in a warm place and allow to rise. Add the remaining ingredients and mix to combine. Line a bread tin (30 x 10 cm / 12 x 4 inches) with parchment paper and place the dough to fill half of the tin, pressing and arranging it to spread and flatten. Cover and set aside for the bread to rise again. Brush with olive oil and bake in a preheat oven to 180o C / 350o F about one hour. Note: If you do not want to bake both breads, you can freeze it and bake it another day. In a bowl dissolve the yeast with water, add sugar and 3 tbsp flour and mix. Cover with cling film and set aside to rise. Mighty scrumptious! This savory bread is impeccable. There are so many flavours in this bread, it must be really delicious. It may be fit for Lenten, but it surely is a temptation! The cut loaf looks so great with the marbled look from the olives! Sounds delicious with the tangerine juice and rosemary. Both the Lenten and non-Lenten versions sound delicious. Lovely flavor combination! Ton pain a un côté rustique qui me plait beaucoup. Avec ce que tu as mis dedans, il doit être délicieux. J’en mangerai une tranche avec plaisir. Your bread looks super delicious with all those wonderful olives! What a treat Ivy! Mmmmm what a nostimo looking and sounding psomi. I am so going to make this. I love everything rosemary… alas I will have to wait until Pascha. Still fasting for the most part over here. une tranche ne serais pas de refus! I had a bread like this in a restaurant a while back and still remember the greatest taste of olive and rosemary fusion. This post contains useful information which helps us a lot. I have never seen such a great post. Your wonderful post can inspire a lot and helps us. I visit your website often and share with my friends.